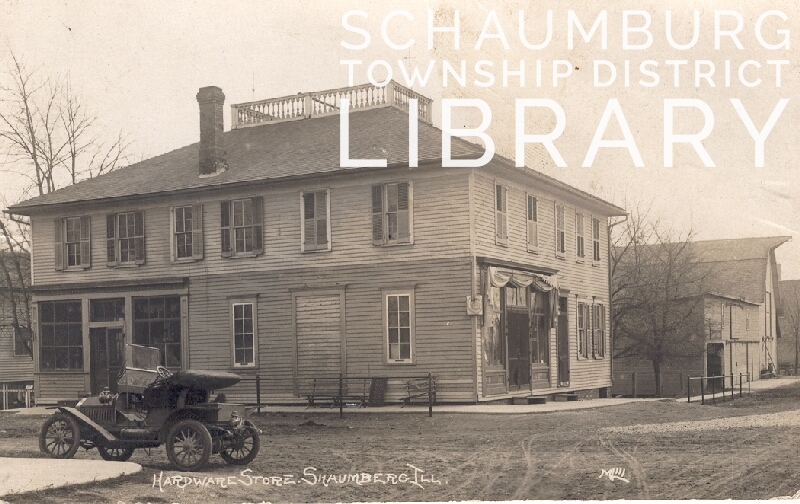 The corner of Roselle and Schaumburg Road was home to various general and hardware stores for many years. 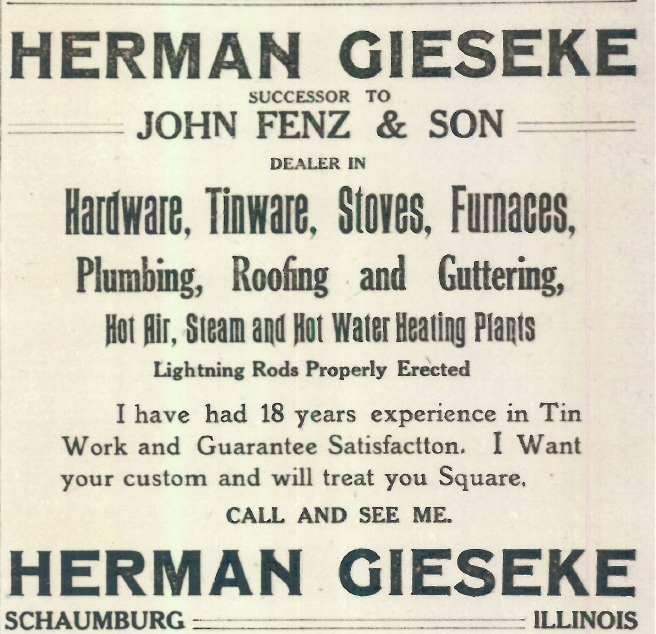 At one time or another you could have found Schaumburg House, Fenz & Son and Lake Cook Farm Supply that would have supplied many of your hardware needs. 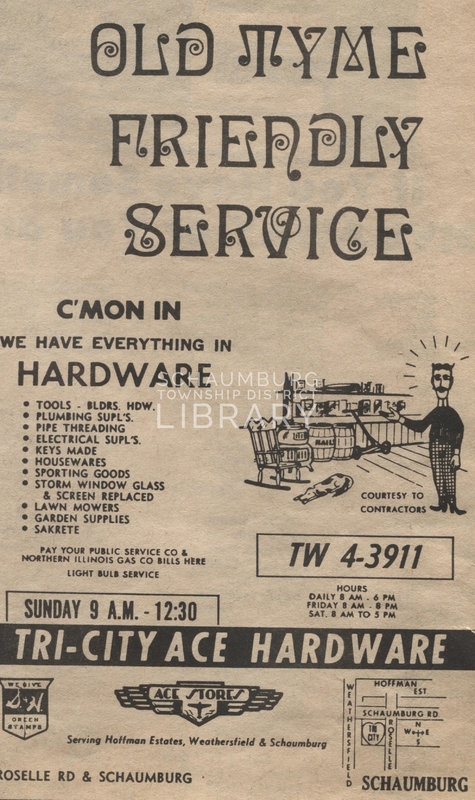 Looking for a new location for a branch store, Tri-City Hardware of Roselle opened in the Redeker building in October 1960, creating the first hardware store in the newly-formed village of Schaumburg. It was a branch of Roselle’s Ace Hardware. 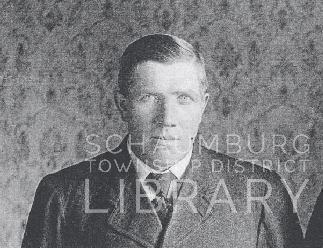 Wilbert Snyder of Roselle was Tri-City’s owner and, according to an October 27, 1960 article from The Herald, James Kali, one of his employees, became the manager. Early on the building was also home to Citizens Utilities with a separate door leading to that portion of the store. It served as a local office and a place to pay your electric bill. There was also a mailbox on the corner of the intersection since the nearest post office was Roselle. On February 1, 1962, George and Miriam Vogt bought the store from Mr. Snyder and ran it for the next 23 years. During that time, they added on to the small building around 1974. They bought the barn to the south and a brown, two-story house to the west, expanding the store in those directions. Jann Jorgensen worked at the store from 1970-1976. As she tells it, she lived in the same neighborhood as the Vogts and when she reached an employable age her father suggested she ask George if he needed any help. George was a bit reluctant to hire a girl in a hardware store but gave her a two-week trial period and wound up hiring her for six years. According to Jann, George was “all about service.” With many new home owners coming to the area, they would bring George their problem. He would take the time to lead them through to a solution, sometimes using pencil and paper to draw diagrams to illustrate what they needed to do. 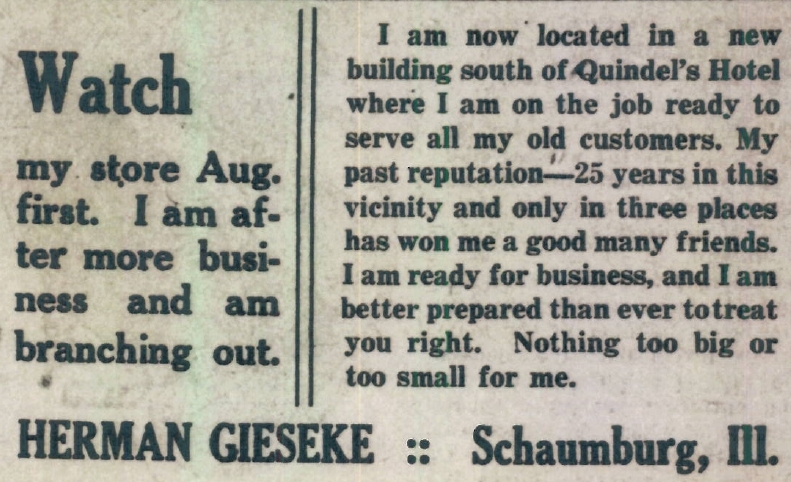 And, as part of Jann’s job, she was required to wait on customers, weigh nails, take inventory, check in orders, cut glass for windows, move and organize the various products and handle the Commonwealth Edison light bulb orders. Jann also remembered that one of the adjacent buildings where the fertilizer, soil, grass seed, etc. were kept had a dirt floor through the time she worked there. In 1986, though, the Vogts decided to retire and sold the store to Joseph Bulgarelli who ran it for the next ten years. 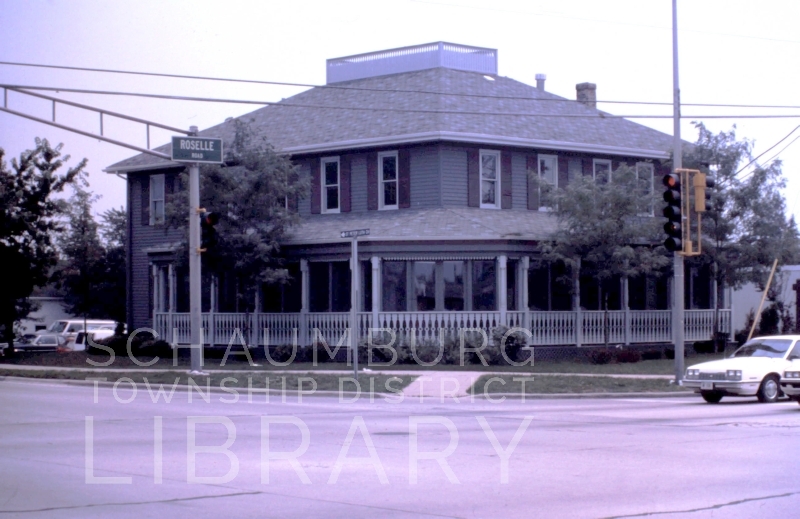 When the village of Schaumburg decided to redevelop the Town Square property, they began negotiations to buy the property, eventually coming to terms in 1996. The Ace Hardware then moved to the Farmgate Shopping Center at 560 S. Roselle Road where it remained well into the 2010’s. This small, long-lived institution helped keep houses repaired and in good order for so many years–particularly as the area grew and expanded. Do you remember Mom and Dad making countless trips as they tackled household chores and repairs? 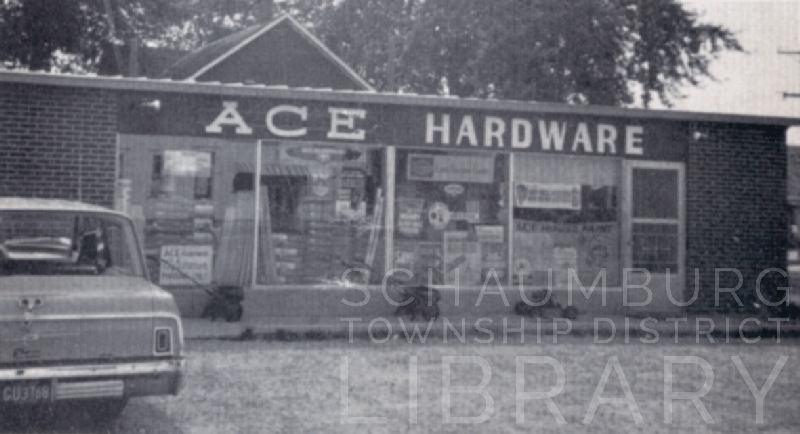 What is your favorite memory of our local Ace Hardware?